A plethora of publications provide valuable information for the organic chemist, yet the results are almost always based on successful reactions. However, a chemist's life is unfortunately not that easy. On the contrary, trial and error is still one of the most commonly used methods. Thus it would be useful to have access to those syntheses that do not work, since they also provide important results of great importance for further synthesis. This long-awaited book by M. A. Sierra and M. C. de la Torre fills just such a gap. Using major total syntheses they explain the most varied problems and recommend ways out of such dilemmas: Problems at the start and end of a synthesis, difficult and unexpected reactivities of functional groups, problems due to steric properties and much more. The result is a true wealth of information for any organic chemist. The essential tool for successful total synthesis. Miguel A. Sierra studied chemistry at the UCM (Madrid), receiving his PhD in 1987, after which he was appointed Assistant Professor. After a postdoctoral stay at Colorado State University (Professor Louis Hegedus), he returned to Madrid where he was became Professor in 1990. His research encompasses the development of new processes based on transition-metal complexes, the preparation of new bioorganometallic compounds tailor-made for specific applications in crop protection, and the study of environmental organic processes. Professor Sierra is the secretary of the Madrid regional division of the Spanish Chemical Society and a member of the Scientific Advisory Board for the Organization for the Prohibition of Chemical Weapons (OPCW). Maria C. de la Torre studied chemistry at the Universidad Complutense de Madrid (UCM) where she received her PhD in 1986. After postdoctoral work at Imperial College (under Professor Steven Ley) and Colorado State University (Professor Albert Meyers), she returned to Madrid in 1989 as a scientific researcher at the Consejo Superior de Investigaciones Científicas. Her current research interests focus on the chemistry of densely functionalized natural products, and the preparation of natural product hybrids with mixed and/or complementary biological properties. Chapter 1: Introduction: From the Paper to the Laboratory. Chapter 2: Tuning-up, Tactical and Strategic Changes. Chapter 3: Working with Models. Chapter 4: The Unexpected Reactivity or Inertia of Common Functional Groups. 4.2 Octalactins A and B. Chapter 5: The Influence of Remote Substituents. 5.1 "Alive" Dead Steric Volume. 5.2 The Reactive Remote Group. Chapter 6: The Elusive Side Chain. Chapter 7: The Unpredictable Stereochemistry. 7.1 Nocardiones A and B. 7.3 Hamigerans A and B. 7.5 Fragment C3-C10 of Cytovaricin. Chapter 8: Reluctant Ring Closures. 8.6 Roseophilin Tricyclic Core: The Formal Total Synthesis of Roseophilin. "...provide[s] devotees of organic synthesis a valuable analysis of the subject...highly recommended." 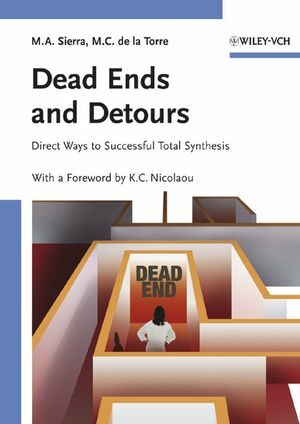 A unique textbook with a unique concept presenting pitfalls, problems and solutions in total synthesis. Foreword written by K. C. Nicolaou. Every organic chemist has made exactly the experiences described in this book, this topic has never been presented before in such a compact way. Using major total syntheses the book explains the most varied problems and recommends ways out of such dilemmas: Problems at the start and end of a synthesis, difficult and unexpected reactivities of functional groups, problems due to steric properties and much more.